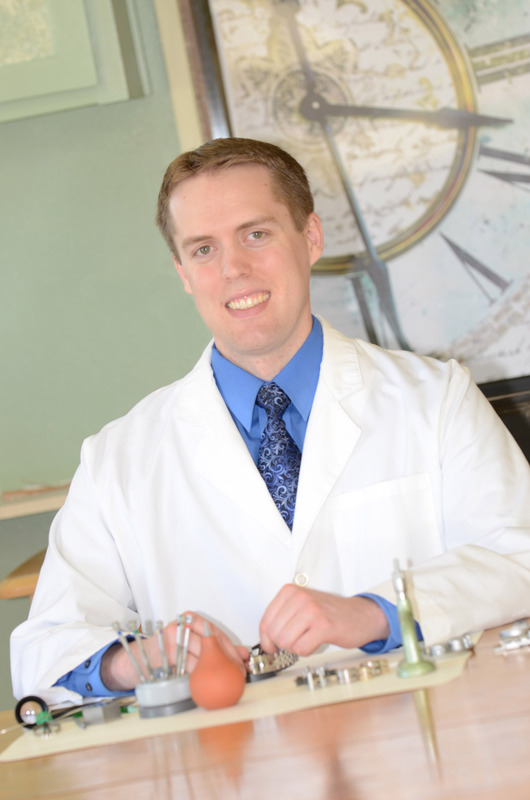 “Healthy Tickers Last Longer” is the tagline Ryan Fox uses as he manages his clock and watch repair shop Tick Tock Time Repair (509-891-8625). Conveniently located at the SE corner of Pines and Broadway in Spokane Valley, Washington. Ryan was born and raised in the Spokane Valley. He was gifted with the natural ability of putting things back together. He used this ability in repairing appliances as he worked his way through college. He loves analyzing things with his mind and can visualize how mechanical objects work without having to see them actually move. During his youth, a hearing impaired neighbor sparked an interest in learning sign language. He began learning American Sign Language (ASL) on his own while being home schooled. Later Ryan attended Spokane Falls Community College and enrolled in the Deaf Interpreter Training Program for ASL. During his college years, Ryan took time out and volunteered to be a missionary for his Church. He was called to serve in Rochester, New York for two years as an ASL missionary. After his mission, he returned home to complete the ASL Interpreter Training Program at Spokane Falls Community College graduating with an AA degree. Following graduation, Ryan worked for Spokane Community College as an ASL interpreter. He also interpreted for the Central Valley School District in all class levels from elementary to high school. Ryan had a desire to return to college and attended Brigham Young University in Provo, Utah where he took various classes in four different majors. While at BYU he studied Bio-Informatics, Mathematics, Computer Science, and Mechanical Engineering. Mechanical Engineering classes particularly began to point him in a new direction. At this time he became interested in clock and watch repair, a micro version of mechanical engineering. Ryan had finally found what he wanted to do. He was able to use his natural intuitive gift in diagnosing and repairing mechanical problems in micro-mechanics. In order to become a watchmaker, he first had to pass a full day of interviews and exams just to be accepted into the Watch Technology Institute two-year program in Seattle. Less than 3% of American Watchmakers have achieved all three certifications. Those knowledgeable about horology will recognize these professional and highly valued certifications. He returned to Spokane to work for a well known, long established family jewelry store in 2011. Ryan worked at the bench repairing all kinds of watches and clocks. In 2013, he decided it was time to start his own business. With the support of his family he opened Tick Tock Time Repair. Ryan is pleasant to be around and cares about his quality of work. He is soft spoken, speaks briefly and concise.